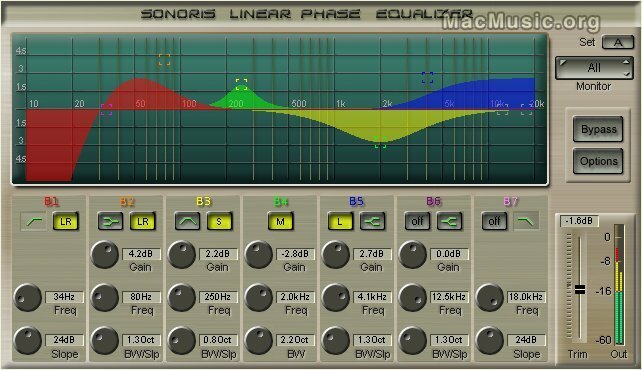 Sonoris Audio Engineering has announced the release of its Sonoris Equalizer and Sonoris Linear Phase Equalizer VST effect plug-ins. - Lowpass and highpass filters up to 48 dB/octave. - Peaking and shelving filters. - Stereo, L, R or MS processing and monitoring. - No pre-warping effects, that is, correct response up to Nyquist. - HQ mode with upsampling for an even more accurate response. - Soft Engage technology on all filters to prevent pops and crackles. - Large graphical display with draggable handles for maximum control. - High resolution level meter. - SSE and SSE2 optimizations. - Settings can be saved. - 64 bit integer math in audio chain, except for the filter code. - TPDF dither is used to convert the 64 bit signal back to the host resolution. - 7 band parametric linear phase equalizer. They are both available now in VST format for Mac OS X and Windows at a price of $225 each.